As a full-service Human Communication Management Consulting Firm, we assist you in managing all personal, professional and organizational human interaction needs. *HCI offers a FREE 30-minute Introduction to the Human Communication Institute: The Staircase to Success! HCI Complete Series is the 7-week intensive program that takes each participant up the entire communication staircase. Starting with intrapersonal and ascending to intercultural, every communication arena is introduced with its specific rules and tools of engagement. Each participant will gain essential skills that can be applied immediately in personal and professional settings. Each clinic provides a senior practitioner who will facilitate an interactive skill based workshops. The program starts with sharing the personal processes of communication that significantly affect interpersonal and group communication dynamics. Each week provides another level of human communication exploration all of which are the primary determinants of personal and professional success. Each class is conducted for 1 hour and forty-five minutes. Each successful participant will receive a training certificate of completion. 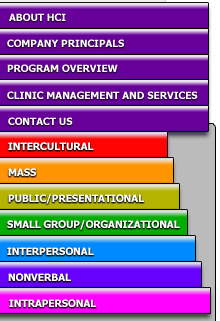 Choose one topic from each communication step or combine 7 clinics as you prefer. HCI offers the Integration Series, a 3.5-week clinic that invites the contractor to combine 3 intensive workshops tailored to their specific needs. Each workshop is facilitated for 2 hours. Each workshop offers valued tools needed to gain effective and transformative communication competence. You may choose your clinics from one or more communication steps. HCI's Spotlight Series shines light on one specific area of communication that needs focused discussion, facilitation and possible mediation. The contractor chooses from either of the 7 communication arenas and creates a 3-week program aimed directly at examining and “healing” a specific communication problem. Each clinic is facilitated for 2 hours. HCI offers all workshops as a part of our Periscope Series focusing on a specific communication skill-set. Participants choose from any one of our intensive workshops listed under the basic course offerings of HCI. Each workshop will be facilitated for 2.5 hours. All program rates are available in both individual and group. Group rates 25 - 100*. With the conclusion of the program, each participant receives a certificate of completion. A complimentary follow-up and debriefing workshop will be offered for graduates and management of the program. Individuals and groups can go on to take additional expanded clinics. At client rates. The Youth Clinics afford the same configuration of clinic offerings for all youth clinics. Workshop package listed above including opportunity to meet and interact with top organizational experts while experiencing a 7-week intensive program.